International Mother Language Day has been observed every year since 2000 February to promote linguistic and cultural diversity and multilingualism. The date represents the day in 1952 when students demonstrating for recognition of their language, Bengali, as one of the two national languages of the then Pakistan, were shot and killed by police in Dhaka,which is the capital of present day Bangladesh. International Mother Language Day was proclaimed by the General Conference of the United Nations Educational, Scientific and Cultural Organization (UNESCO) in November 1999 (30C/62).On 16 May 2009 the United Nations General Assembly in its resolution A/RES/61/266 called upon Member States "to promote the preservation and protection of all languages used by peoples of the world". By the same resolution, the General Assembly proclaimed 2008 as the International Year of Languages, to promote unity in diversity and international understanding, through multilingualism and multiculturalism. 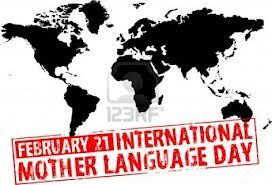 In 2008, the International Year of Languages was formally launched on International Mother Language Day.